Size: 361 sq.ft. - 700 sq.ft. Godrej Properties has come up with a great fusion of convenient and comfort lifestyle residential venture named Godrej Sky Gardens. Godrej Vihaa is a large community of 51.20 Acres where 12.84 Acres is dedicated to Sky Garden Residential towers.Godrej Properties has launched 3 Towers of same height in the Sky Garden project. Godrej Sky Gardens is definitely beneficial who are looking for a worth to buy propertywhere this development that can fulfil the purpose of investment as well as personal use.The heartwarming and pleasing homes are available at prices starting at just 28.95 Lacs - 44.95 Lacs INR. The possession is expected by 2022. Godrej Sky Garden offers fantastic family friendly options that provide residents ample space to connect, share and grow. Godrej Sky Garden is sprawled over 12.84 acres of landscape at Godrej Vihaa Community at Badlapur East beyond Thane.The majority of the space is converted into the empty landscapes. It is fully equipped with day to day latest features what a home seeker look for. The builder has ensured each homes of this community get ample of natural light with proper ventilation so each tower is having 24 floors with wide balcony to each apartment.It offers spacious skillfully designed 1BHK and 2BHK apartments. The project is well-equipped with all the amenities to facilitate the needs of the residents.One Bed apartments are covering square feet area of 465(28.95 Lac) & Two Bedat 700 square Feet of area (44.95 Lac). Badlapur East is a developed location of Mumbai and well known for its affordable housing & real estate destination. 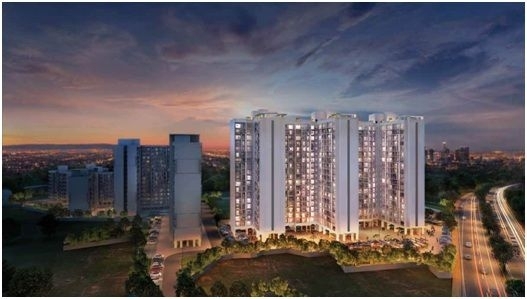 In Badlapur it is easy to find a quality & affordable living space inside a secured & gated community at Godrej Vihaa. It is situated at a location from where the member can have easy access to all the required facilities for routine life.The location has smooth connectivity via the Mumbai-Pune expressway. NMMT buses and fast trains are the main means of transport. For easy commutation, there is Badlapur Railway station at a distance 2.3 kms only. The project has numerous reputed schools at distance of 10 minutes, Hospitals are also at a distance of 6 minutes, banks/ATMs are also at a distance of 8 minutes andshopping malls & supermarkets at a walking distance only. Godrej Sky Gardens is a residential project located in Badlapur East nearKharvai Naka, Beyond Thane. Godrej Sky Gardens Mumbai bathed in fully secured and useful facilities includes Reflexology Path, Star Gazing Deck, Life-Size Snake Board, Life-Size Chess & Ladder Game Zone, Clubhouse with all the modern facilities, Entertainment zones in close proximity, Well Connected to all the major rail networks & roads, Party Zone, Barbeque Area, Toddlers' Area, Zen Garden, Yoga & Meditation Pavilion, Skywalk, Flower Garden, Senior Citizen's Alcove,Rooftop amenities, Indoor & outdoor games, Gated community, Swimming poll, Kids area, Senior citizen area, Smartly designed Homes, 18 Storied Towers, Self sustained eco-system with retail plaza. Schools - Podar jumbo kids plus daycare, S.D.M English High School, Rainbow Preschools, Holy Spirit High School, SamarthaVidyalay. Hospitals - Swanand Children Hospital, Shree SiddheshwarPavnai Nursing Home,SaiSparsh Hospital, Ashwini Hospital. Shopping Malls/Centres – Krishan Mini Mall, Metro Junction Mall, Sarvoday Mall, D-Mart. Bank/ATMs - State Bank of India, ICICI Bank, HDFC Bank, Union Bank of India. Rail Stations – Badlapur railway Station,Vithalwadi Railway Station,Ambernath Railway Station, Ulhasnagar Railway Station. 361 sq.ft. - 700 sq.ft. 590 sq.ft. - 925 sq.ft.